Before I dove into espresso I occasionally made coffee in a Bodum French Press. I used a simple 10 euro blade grinder to get a certain amount of “ground” beans, added some water and presto, coffee. Drinkable too. Grinding for espresso however is a whole different ballgame. Espresso needs a very consistent and very fine grind. Now I could just go to the store and get a pack of pre-ground coffee, but that just doesn’t work. When you buy a bag of beans at the grocerystore you’ll most likely find a “Best before” date printed on the bottom of the bag but no sign of the date when it was actually roasted. Rule of thumb being that beans should be used within a couple of weeks after being roasted you can safely assume that those beans are quite a bit older already. Back to grinding for espresso. It needs to be fine and you need to have control over the grind. With a bladegrinder you generally hold the button for as long as you want to “grind”. However you will never get a consistent grind, some of the beans will still be very coarse, some just right and a the rest is dust. For an espresso you need a decent burr grinder. Burr grinders come in various shapes and forms but generally you can divide them into 2 groups, manual grinders and electric grinders. Manual grinders are often a lot cheaper but do require a manual rotation of the burrs. Who would’ve seen that one coming right? I wanted an electric grinder because I can’t be bothered with a manual grinder. After a little Googling I came up with a couple of websites and forums that had great deals of information. 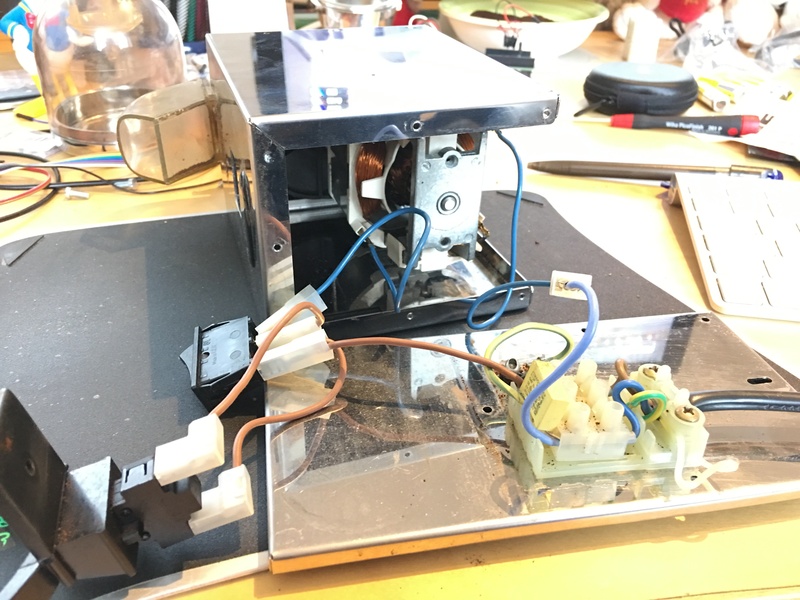 On the german forum Kaffee-Netz(.de) I found a very specific write up on how to convert a Nemox Lux grinder to a stepless grinder. By default the Nemox Lux as well as other low-end grinders have very general grindsettings. 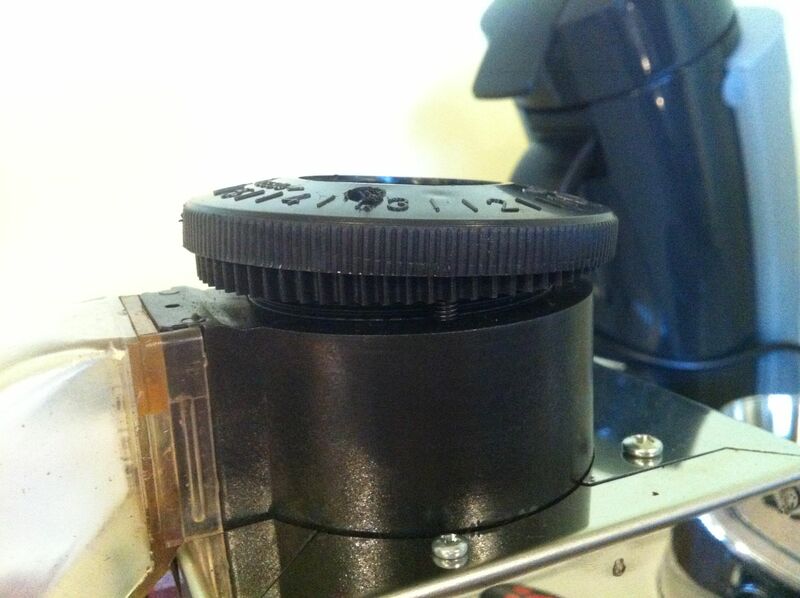 Basically you turn a disc with holes that are used to lock the top burrholder in a certain position. The holes in this case were about 5-6mm apart so going “one notch coarser or finer” meant going at least 5mm in either direction. Thankfully there’s a rather simple solution to this problem by adding a single piece from a different brand of grinder to the Nemox Lux. I got all my parts from EspressoXXL(.de), the owner is a very kind and patient person that will happily answer any and all of your questions you might have. First we remove the plastic hopper, to do that we must first remove the screw that holds the hopper and burrcover in place. The screw was in between the 3 and 4 on my settingdisc. Now we remove the top cover from the upper burrholder. It’s firmly held in place by nothing but friction normally so a good pull should get it loose. Undo the two flathead screws right behind the burrholder on top of the grinder. Get new screws. The original screws are too short to hold both the metal cover andthe spindle so get a couple of longer screws. I prefer stainless for everything and since I still had a few in my partsbin i used those. Remove the top burrholder. The top burrholder screws out quite easily although you might have to undo the little hex-bolt that’s in the top holder. While you have access, grab a brush and clean the burrs and grinding area. Disable the locking mechanism. This is what keeps the top burrholder from rotating during grinding. Since we won’t be needing it anymore I suggest you disable it by removing just the spring. Or if you don’t like useless parts on your grinder you can remove the pin as well. Re-mount the top burrholder. Turn it all the way down until you feel a LOT of resistance. Then turn it back one full turn. Make sure the burrs are not touching since that will damage them! Bolt the spindle in place. I mounted the spindle loosely on one side first, then adjusted the wormgear so that the spindle’s second hole lined up perfectly and then put the second screw in. Remember you are mounting a piece of plastic with a stainless steel screw in a plastic holder so do not over tighten them, you can only screw this up once (pun intended). Presto. You now have a stepless grinder the way Saeco / Nemox never intended you to. Well that was it for my very first post on here. I’m aware that there are probably a ton of sites out there that discuss this modification or a variation on it to some extent but I thought I’d clear a few things up by doing a step-by-step writeup. And now for the obligatory disclaimer: if you mess up and in some way harm yourself or anyone else, screw up your grinder or anything else you have nobody but yourself to blame. Thanks for the How-to. Your description made doing this a piece of cake. Sebastiaan, thanks for posting this. I had to take the top of the grinder off as my hopper broke and I had plastic ‘shards’ sitting between the burrs. I followed your how-to just for disassembly and cleaning, but now that I’ve seen how easy it is to take this apart and tune it, next step is to make it step-less. I’m noticing that I’m now dialled down to zero and my grind is not as fine as I want it. With a bit of a tune though, it should be good as new. Despite this, I love the Nemox — considering I’ve put it through some hard yards daily for the past 5 years and this is the first thing to break on it, it has served me well. The hopper is perhaps the weakest part of the grinder, most people break it trying to remove it without backing out the screw. But the hopper does have an ideal size for home use, much better suited than a Mazzer Super Jolly’s hopper that’s for sure. Hi, I have a Nemox Lux, would you recommend going through this procedure and does it give a better grind and constancy?. Would be great to get an understanding of what the change has done? Also, how regularly do you clean your Lux?? I have had mine for 6 weeks and haven’t taken anything apart to be cleaned yet … is this to long? Will hopefully be able to find the parts on an English speaking site if so. Hi Darren, the modification gives you better and finer control over the grinds coarseness. I’ve found the Nemox to be quite consistent out of the box, this mod doesn’t change that. The frequency of cleaning really depends on how much you grind and how oily the beans are. The more you grind or the more greasy / oily your beans are, the more you have to clean the machine. The best thing to do is to inspect it regularly, make sure it’s empty when you don’t use it and keep it away from moist areas. If you notice the grounds being ejected slow or difficult, it’s time to clean. My Mazzer for instance is cleaned every half year back to front. I always make sure the grindingchamber is empty and the doser is as well. I run a brush through it every other day at the very least. Should you have trouble sourcing the parts I can buy them for you in Germany and then ship them internationally. Hi Sebastian, thanks for getting back to me! I think finer control may help with my shot pulling. I’ve really been finding it difficult to dial my shots in accurately with the steps on the grinder. I am using a Rancilio Silvia V3 with my Lux and sometimes (randomly) get a good shot!. I’ve tried altering the grind quite a lot, and also the dose in the porter filter! Hi Darren, having more control over the coarseness of your grounds is a godsent, especially when your espressomachine is picky (like my La Pavoni). Try not to change too many parts of the equation at a time though. The first thing you should do is trying to get a baseline. I like to start with the basic requirements for a single shot of espresso: fresh beans(!!! ), 7 grams of ground coffee, a 25 second pull and a 25ml yield. The first thing to do is measure 7grams of grounds. Then get a tamper and with normal pressure tamp. Put some pressure on it but by all means you’re not trying to press the puck through the portafilter with your tamper! Pull a shot with a stopwatch running. Stop the stopwatch when you have pulled a 25ml shot. If your shot times are more than more than 3 seconds too short, adjust the grind finer. More than 3 seconds too long, adjust it coarser. If you’re less than 3 seconds off the mark you can usually try to get closer by adjust the tamping pressure. Too fast, tamp harder. Too slow, tamp lighter. If that doesn’t work adjust the grind accordingly. Whatever you do, do not adjust tamping pressure and grind at the same time! Something that most Nemox Lux users are accustomed to is static causing clumps in your grounds. Clumping can cause channeling in the puck which leads to watery espresso’s and too short shot times.To neutralize that static i like to use a stainless cup to grind into first, then swirl it around the cup and then put it in the basket / portafilter. Thanks Sebastian, I think the modification for the grinder might be beneficial for me then as I seem to have exhausted all of the settings that come as standard in terms of coarseness on the Lux. I only have a double shot basket unfortunately and I have been using 14 grams of fresh grounds and weighing the shot and getting roughly between 30 – 33 grams of coffee out over about 21-24 seconds … This seems to be too quick but I can’t adjust the grinder to another level with out the shot time dramatically changing. the taste of the coffee isnt completely horrendous, but I know there are a few more flavours to pull out and less tartness at the end of the shots I’ve been pulling. I read online somewhere that each pre setting on the Lux could change shot time by 7 seconds (could even be somewhere on your blog, I’ve read so much lately I’m a little lost) so by doing the modification that may give me the control I need to add 2/3 seconds to my shots but also aim for between 29 and 30 grams off coffee during the 25/26 seconds. I wonder if you can help me … again! I have been pulling some good shots with the Nemox Lux since my last post but then something happened today that caused a bit of a problem! I was pulling good tasting shots but they were extracting over 30 seconds and after posting on the Home Barista (good site!!) web page someone suggested I kept the dose the same but change the grind to a little courser to speed the flow up. Anyways; I changed the grind setting (and couldnt have been paying enough attention) because I went to far and the next shot pulled in 14 secs and 30g in the cup. Then the grinder started to become very difficult to change the grind settings (either way). After taking everything apart cleaning it etc and wasting A LOT!!! of coffee I think I’m almost back to where I started, however the grinder is still very stiff to change to a finer grind setting, and when I try to make it finer it feels like I’m turning the burrs inside and I can hear the motor as I have to use a fair bit if effort to make the adjustment when it should be quite easy … so, seeing as you are the only person I know who has good experience with the Lux I thought I’d ask! Anyways, i’m having a bit of trouble figuring out what it is that you’re asking. If it’s very hard to change the grindingsetting (rotating the top burr carrier) what probably means there is some sort of debris in the threads. You’ll have to take it apart again and make absolutely sure there’s nothing in there and the threads are undamaged. The threads are very fine and very shallow which means that any sort of debris will make it virtually impossible to adjust the grindsetting. Also, if you have grounds in the grinder you should have the grinder running to adjust otherwise the beans in the chamber will block the burr carrier from coming down (up / coarser should be no problem). If you’re asking why the motor has trouble rotating that could be caused by a myriad of things. There might be something stuck underneath the wipers in the grindingchamber for instance or the motor itself might be having trouble (bearings, anchor, etc.). As for the modification, it’s well worth the few bucks to add the spindle and wormgear. I’ve done it on a few now and the results are amazing. yep. time to do it, but i cant read the german webpage to the link for the parts. Have tried to source elsewhere online but am not confident they are the same pieces?! Also, do you have a close up of how the piece is fitted to the main body of the grinder please? would be good to get a better idea of how to attach! Also, RE point 7 reattached top burrholder? i’m guessing this is the part that could damage the grinder if goes wrong, is the resistance the two pieces locking together? I honestly didn’t look much further for the parts once I found them in Germany but I am sure there are some shops that carry the parts in the US or just about anywhere else. If push comes to shove though, I can order the parts for you and send them out to you. If you look at the fourth picture in the article you see two screws behind the grinding chamber. Take those two screws out and get two identical but slightly longer screws. Now take the spindle and mount it with the two new screws into the existing holes. 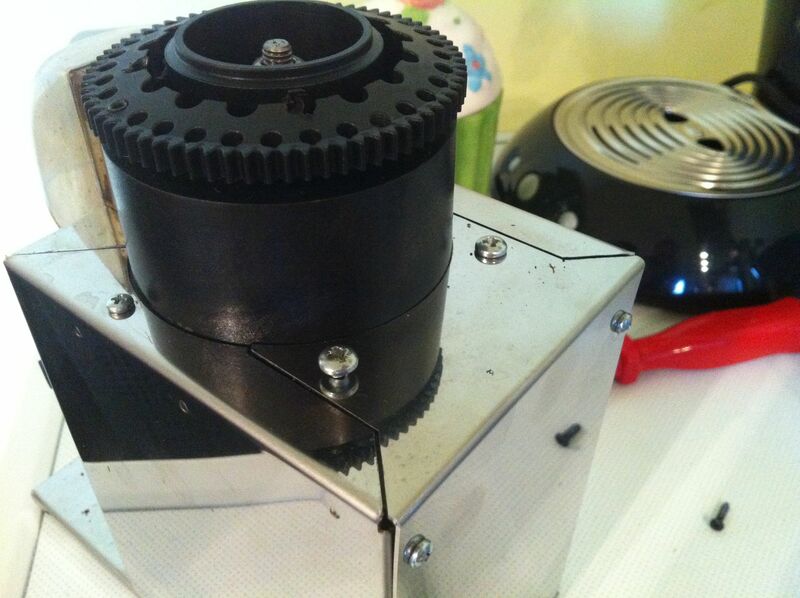 The wormgear on the spindle is what keeps the burrcarrier from rotating. You do have to remove the original springloaded locking pin that will otherwise keep the burrcarrier from rotating. The mod itself is completely reversible on the Nemox Lux so if you end up not liking the mod you can just undo it. Tried this out on my LUX and I love it, much better control of the grind now! 1. Going from a fine setting for espresso to a coarse grind for pour over takes a while because of the slow rate of the wheel. Not a problem if you’re only going for espresso though. 2. You lose the numbers on the plastic scale when removing it which makes reference a little bit harder. Guess you can always use the little stopping-screw underneath for reference though. Maybe it’s a good idea to put a reminder on those two in the tutorial, but as I see it….the benefits of having a stepless grinder wins over those cons anyway. it indeed is quite a task to adjust the grindsetting from espresso to for instance french press. The scala on the upper burrcarrier can be trimmed to fit though, but when you are fine tuning you will probably stay within one or two numbers. I agree it’d be a useful item to put back on but in the spirit of this being a completely reversible modification i opted not to. I have encountered a real ” Enigma ” . My used Nemox Lux did not have a screw retaining the hopper .Nor was it a tight push fit on the burr carrier . Furthermore there was no hole drilled in the burr carrier cover . As I was planning to carry out the step less mod I decider to cut off the cover . Under this I found the screw with the head sheared off ?? ?and it could not be removed ??? My query is ” How did the screw get so tightened to shear the head when there was no hole in the cover to access the screw ” ??????? All replies gratefully appreciated . that is quite strange indeed. Usually when heads shear off bolts or screws there is a fair amount of force to blame. However that would still require physical access to the head itself first. How that happened on your particular Lux has me baffled. I can only imagine that someone has previously bent up the the cover and then tried to use a screwdriver to mangle the screw. Or the cover has been bent up and rotated, but then there should be a hole somewhere in the cover, just not in the right location. Sorry but I drilled the cover myself (Very carefully ) Even after drilling I could not see the screw . That is when I decided to destroy the cover and found the sheared off screw . It is far too small to drill and tap so there is nothing else I can do . For the moment I have just removed the stop screw to give me a fine enough grind . My mistake, I thought you were referring to the tiny screw that holds the hopper in the upper burr carrier. If you are in fact referring to the little screw that normally prevents over-tightening of the upper burr carrier then yes, that screw doesn’t have a head and isn’t visible when the cover is still on the upper burr carrier. The screw has no head and you need an Allen (hex) key to (re)move it. I am talking about the screw that retains the hopper . 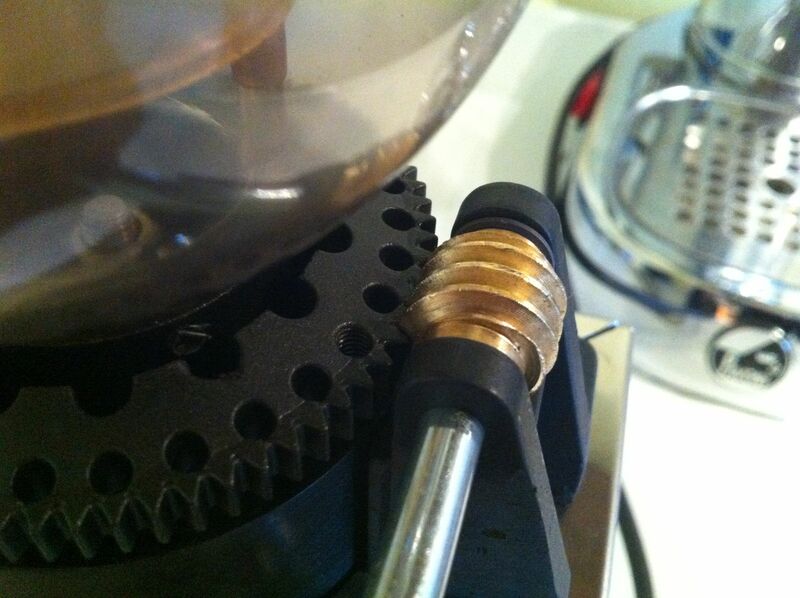 In your forum you mention removing the hopper and screw down the top burr until the bottom burr moves with it . As i couldn’t remove the hopper I had to remove the ” safety stop screw and ” Feel ” when the burrs touched . I then marked the top of the burr carrier so that I never got the burrs to touch . Still have the problem of never being able to remove the hopper though ! After such a long time I feel I should update you on my experiences with the lux . I have had three Nemox Lux grinders in total and modified all of them . The grind difference is obvious with the worm modification . I have had a number of scarey moments having totally seized the top and bottom burrs by accidentally switching on the grinder when the worm gear wasn’t fully engaged . I have ground down the head of a screw and and placed it in the place where the step adjuster sat and re introduced the stop screw in the upper carrier . I then screw in the stop screw so that it just makes contact with the ground down screw at a point approximating to one full turn of the upper burr holder . I have sold on two of the grinders and the buyers are more than happy . I keep searching for some cheap Nemox grinders in europe but they are few and far between . Glad to hear you’re as happy with these nifty little grinders as I have been. My Nemox has spent a few years at our neighbours and they too have been very happy with it. A free spinning top burr holder is quite a hair raising occurrence, I’ve had a few of those myself haha. Now that my Nemox is back, I’ll have to try your mod, seems like a good plan! If you’re looking for Nemox grinders to modify and sell, look into the Isomac and Lelit versions as well. But beware, although you can use the worm gear and spindle to mod the Lelit and Isomac versions, they are ever so slightly different. Parts like the grinding chamber, top burr holder and motor may look similar but they are different enough to be completely incompatible with each other. Do you have a circuit diagram for this machine? ?